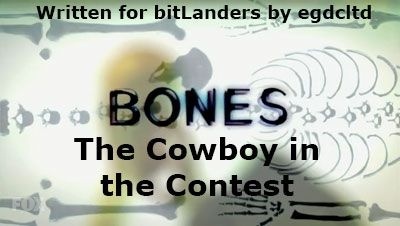 "The Cowboy in the Contest" is episode nine of season eleven of Bones, the forensic drama television series loosely based on the novels and life of anthropologist Kathy Reichs. 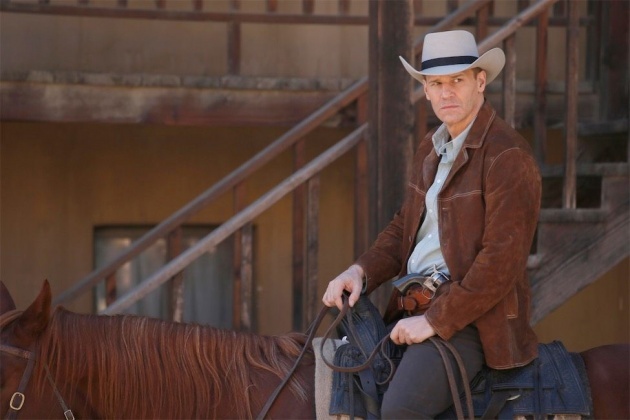 In this episode, Brennan and Booth go undercover at a cowboy theme park after an accountant is found dead. This episode opens with Cam at home in bed - and Sebastian enters the room. In "The Promise in the Palace", Cam had decided to give him a call after all. Cam then gets a message to her phone about a body that has been found in the east Virginia parklands that's being taken to the lab. Brennan and Booth are in his car and she asks him for his opinion on cauliflower. Roasted, yes; boiled, no. Booth wants to know what Brennan is doing; she is meal planning as she's decided to use their time together productively. In the glove box, Booth has a picture of a motorcycle. Brennan wants to know why he has such - Booth is looking at getting one. Brennan isn't happy. She says that their professions are risky enough, so why take extra ones (and motorcycles and middle-aged men tend not to mix together very well). Daisy is helping Cam and Hodgins with the body. The body had been bound, is male and, as Hodgins puts it, died with his boots on. Cowboy boots. The victim was a heavy smoker and was in his mid 30s. Hodgins puts time of death at 26 days ago and Cam says that cause of death is pretty obvious; multiple gunshot wounds to the torso. There is also trace around the wounds that Hodgins believes came from black powder, which is rarely used these days but was common in the early 1900s. The victim also has leather particulates on his forehead. Perhaps suggesting a cowboy hat. Brennan arrives and Daisy mentions finishing up before she has to go. It seems that Hodgins wants a new piece of equipment, so Cam is cutting back elsewhere as a result, so no interns for a couple of weeks. The victim also has pronounced muscle attachment for his trigger finger, shows signs of heavy firearms use and has a jaw injury consistent with shotgun kickback. Hodgins asks if there's anything about the victim that doesn't scream cowboy. Angela replies yes; he was an accountant called Stanley Belridge. According to Aubrey, Stanley had no family in the area and few friends. He was reported missing by his supervisor at work two weeks ago. According to Baltimore PD, missing adults are not a priority and, because the body was found outside their jurisdiction, they graciously allow the FBI to take over the case. Stanley's supervisor, Jim Chou, when asked why it took him so long to report Stanley missing, replies that he barely knew the guy and assumed someone else would do it. Aubrey wants Stanley's files and computer but Chou says that there are sensitive personal financial files on it, so a warrant is needed. Which will not be a problem. Stanley wasn't killed where he was found, so it was a body dump. Where Stanley was last seen alive was at the Frontier Games, a Wild West role-playing theme park with a shooting competition held once per month, using genuine vintage guns. Hodgins likes the idea. Stanley - or Slow Burn Stanley - had just won $10K in the competition, which is a motive. With it being 26 days since Stanley was killed, the next games are coming up this weekend. Cam is certain that Booth already knows this. Indeed, he does, and he is planning to go undercover. Aubrey tells him that just sounds like a reason to dress up and play cowboy. Booth points out that it's to solve the murder; the rest is a bonus. Booth asks if Aubrey has a problem with that idea. Aubrey doesn't, and is perfectly willing to go with Booth, but that idea gets nixed. Brennan is not so happy because, with no intern, she can't leave the lab. This will be the first time Booth has gone undercover without Brennan. Back at the Jeffersonian, Brennan tells Angela that she can't figure Booth out at the moment. In the previous episode, "The High Treason in the Holiday Season", Booth was after a jet ski and now he wants a motorcycle, and has gone off to play with guns. Angela says that the problem is the routine; Brennan asks her if Booth needs excitement. Angela tells her that they both do. So Angela tells Hodgins that he isn't going to get his new toy, because Cam is paying Daisy double so that she will work in the lab that weekend. Plus they're looking after Christine and Hank. Brennan has gone to the Frontier Games as well. However, she and Booth have gone as strangers who don't know each other. The local 'marshal' takes a shine to Brennan too. At the first competition, Booth shoots incredibly badly and Brennan does a lot better. This eventually becomes a rivalry, as Booth says he was deliberately shooting badly. So they both start competing with each other. One of the other attendees recently paid off $6K in overdue child support. The thought is that he might have got it from the $10K that Stanley won. Except that Stanley's car is found, and the cheque is still there. So that wasn't it. So, although they have a cause of death for Stanley, they are missing a motive and also an explanation for some peculiar micro fractures to the victim's skull. Cam gets worried that Sebastian is getting too serious, so Daisy gives her some advice on what you should do following the loss of someone - however that happened. 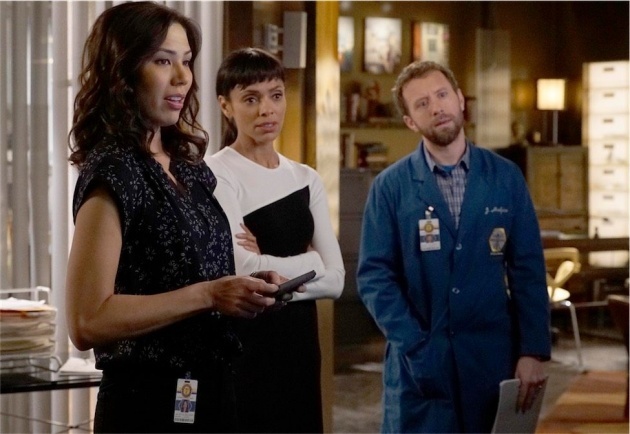 Hodgins gets worried that Angela is wanting another child now; he seems less keen currently - especially as he thought she was actually pregnant.